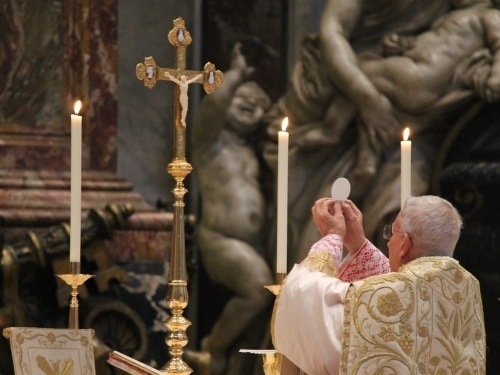 In the wake of the modern ecumenical movement and following decades of watered down catechesis it is no wonder that the Holy Sacrifice of the Mass is so misunderstood. Indeed, for many the Mass is simply a communal “celebration” to be lead by a “presider”. The understanding that the Mass is a true and proper sacrifice which is offered to God the Father has often been lost. The realization that it is Christ who offers Himself, both priest and victim, in an un-bloody manner on the altar is absent among many. That 10 percent of Protestants in the United States are ex-Catholics speaks loud and clear to this crisis. Further, a 2008 study by the Center for Applied Research in the Apostolate (CARA) found that 43 percent of Catholics agreed with the statement, “Bread and wine are symbols of Jesus, but Jesus is not really present.” Some surveys have shown that number to be as high as 70 percent. The following selected excerpts are from “The Holy Mass” by Dom Prosper Guéranger. A Benedictine priest, as well as abbot of Solesmes Abbey and founder of the French Benedictine Congregation, Dom Prosper was one of the foremost liturgists of the late 19th century. In the beautiful and soaring language of Guéranger we find a clear and unambiguous explanation of the Sacrifice of the Mass and the Real Presence of Our Lord in the Eucharist. His description of consecration is an antidote in and of itself to the poor catechesis so many of the faithful have received. The Priest then holds the Host in both his hands, between the thumb and index finger, and pronounces the words of Consecration, in a whisper, yet distinctly, and keeping his eyes fixed on the Host which he intends to consecrate. The moment that these words of Consecration are uttered, the Priest, on bended knees, adores the Sacred Host. The rubric says statim, at once; he must leave no interval, for the Bread has gone, there remain now but the species, the appearances; it has yielded its place to the Lord, it is the Lord Himself whom the Priest adores. Rising from his own act of Adoration, the Priest uplifts the Host, raising It above his head, to show It to the Faithful so that they too may adore. Formerly the Host was not elevated at this part of the Mass, but only just before the commencing of the Pater. In the Eleventh Century, Berengarius, Archdeacon of Angers, having dared to deny the Real Presence of Our Lord in the Holy Eucharist, this Showing of the Sacred Host to the people, in the Mass, immediately after Consecration was introduced, in order to excite them to adoration. After this august ceremony, the Priest lays the Sacred Host on the Corporal and again kneels in adoration before It. From this moment, each time that the Priest touches the Host, he will genuflect both before and after doing so; before, because he is going to touch the Lord, and after, in order to pay Him homage. Besides this, he will not disjoin the thumb and index finger of each hand, until the Ablution, because these fingers are sacred, and have alone the honour of touching the Lord. For this reason, at his Ordination, the Bishop consecrated these fingers in a more special manner, putting the holy oil upon them first, and thence spreading it over the rest of the hand; if a Priest were to lose one of his index fingers, he would need permission from the Pope himself to touch the Body of the Lord with another finger. Such are the words of Consecration of the Wine, the effect of which is so tremendous. They constitute together with the Words of Consecration of the Bread, the Sacrificial Act itself. Our Lord is the Victim, the Victim immolated on our Altar; not merely in the sense that the Holy Mass, by the mystic separation of the Body and Blood, represents and recalls to us the bloody sacrifice of Calvary; but furthermore, because of the very state and proper destination of the Body and Blood of Our Lord, under the Eucharistic Species. Never was victim in any sacrifice, more truly slain and immolated, than is this Divine Victim of ours, as soon as the Consecration is achieved, when He who is the Splendour of God the Father, has now no other end and destination for this His Divine Glory, Beauty, and very Life, than to enter into us, there to be wholly lost and consumed. Posted on February 21, 2014, in liturgy and tagged consecration of bread, consecration of wine, dom prosper gueranger, real presence, sacrifice of the mass, the holy mass. Bookmark the permalink. 4 Comments. Have you no sense of humility? All I ever read in your posts is a lot of whining about the beliefs and practices of others. You want to carry the church back to the 13th century. Progressive Catholic feel that they have been made unwelcome by your hubris. Those empty pews are your doing. Whining? The only whining I encounter among Catholics are those who feel the need to identify themselves as “progressive”. Noting that you align yourself with St. John Vianney I wonder if you’ve ever read any of this venerable saint’s sermons? If you ever did I suspect we’d see some real whining. You are one powerful man, Jeff, to have emptied an entire church. I stand amazed. Keep telling it forth, brother. Good post! The sooner the true nature of the Mass can be widely restored (through sustained and robust catechesis, stronger rubrics for the celebration of the Ordinary Form, more frequent celebration of the Extraordinary Form/Gregorian Mass, improved formation of priests and their exposure to the EF/GM) the better! I cannot count the times I’ve chatted with Catholics who have no idea that the Mass is the one and same Sacrifice of Calvary. That ignorance, willful or otherwise, permits far too many liturgical abuses and a lack of conviction among Catholics. We need real believers who are willing to defend the Faith undefiled in the public square, not limp liberal-religionists who water down the Faith and lead others into their sin of dissent.